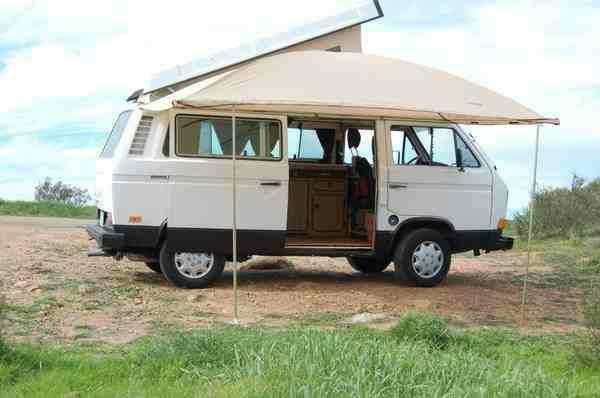 Buy Classic Volks – Here a Volkswagen Westfalia Camper for sale in Las Vegas. This a third generation of Volkswagen type 2 known as T3, it a camper model built by Westfalia was released in 1980 has been rebuilt engine, has 104000 original miles good condition ready to go. Less than 6000 miles on a rebuilt engine and less than 5,000 miles on a rebuilt transmission. Current odometer reading is about 104,000. 4/2011 All curtains removed, washed and reinstalled. Washed bunk bed cushion covers and installed new foam and hardware. New upholstery, fabric and foam padding throughout. 5/2011 Fiberglass top removed, cleaned, and sealed on the outside, scrubbed and bleached inside. New three window canvas pop top install with new pop top seal kit. Gas tank removed, professionally boiled out, all new gas lines, seals, and hoses throughout. Replaced hoses and seals in engine. 7/2012 New Kenwood stereo with removable front face, CD, front USB port, Aux port. New Pioneer front 4″ and rear 5″ speakers, and remote control. 10/2012 Entire vehicle sanded, primed, and new paint on body and fiberglass top. “Rhino coating along bottom edge. Front windshield reinstalled with new seal. High pressure fuel lines replaced including two fuel injectors and including injector seals. New hook-up kit for electrical, water, and tank fill. New water fill hose. 7/2014 Inner and outer tie rods and brake hoses. 7/2014 Extra large Ezy Awning purchased. 2/2015 Windshield/high beam switch replaced. 6/2015 Cold start valve connector replaced. Vacuum line for distributor advance repaired. The refrigerator, which was another common problem, has been removed and turned into valuable storage space. (The original refrigerator will go with vehicle.) The space could easily hold a port-a-potty, or a Truckfridge ac/dc fridge could be installed. Previous owner used a 2 cu. ft. refrigerator/freezer that runs on electricity (included also). This works if camping somewhere that you can plug in, or with the capability of having an auxiliary batter installed, this could probably be used with that. The invaluable Bentley Manual is included also. What still needs to be done: Window seals could be replaced and heater hose needs replacing. There are some small rust spots appearing around some of the windows. My wife and I purchased this Westy with the intent of taking it on weekend camping trips around Las Vegas, but we sadly have to sell it as soon as possible because we are moving out of state. We love this van! 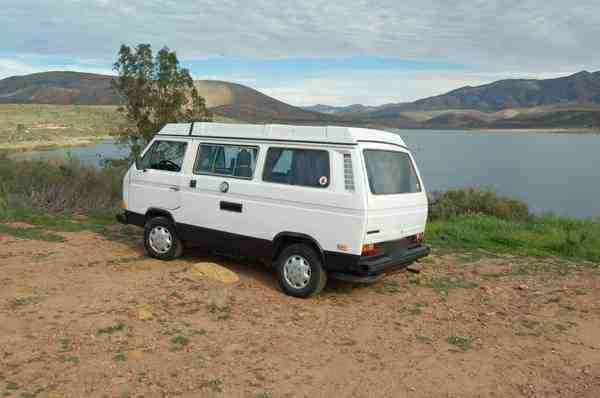 This Westy is so close to being the perfect cruiser camper. If you’re a serious buyer, you’ve done some research and know that these are collectible vehicles. Serious inquiries only. This entry was posted in 1980, Bus, Closed, USA, Volkswagen and tagged Westfalia Camper Vanagon on July 5, 2015 by buyclass.